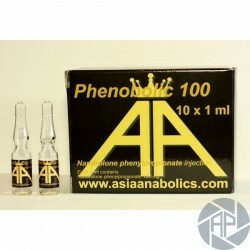 Description:It is one of the most popular drugs. It participates in the definition of muscles, increasing its relief. Only act favourably on the body as a whole, what with free radicals, and salt. Take a vial of 7 days. The course of 6 to 8 months. Not to bend the nandrolone feni prop nato dose or continue after the course. Take the women that breastfed pregnantly. Medical consultation. You can take only if there are no contraindications, individual sensitivity and adolescents up to age 21. Women can participate only in smaller doses, which are calculated on an individual basis. Following all rules and regulations necessary for the reception, the drug does not cause harm to the body. At the same time, for your safety and more confidence before taking a better examined by a doctor, like a body, each person is different, and it is impossible to predict how would react to a drug in particular. The study will help to identify and prevent, for example, a reaction allergic or others symptoms not are favourable. Not to bend the dose to take more time than the specified index.